Three years ago, on a cold December night, I left my heart in Budapest. As we cruised down the Danube that evening, the river glistened with reflections of the city lights, magnificent buildings and clear, starry sky. It was pure magic, and I knew in that very moment that I would be coming back. Of all the countries in Europe, the most unique for me would be Hungary. The landlocked nation is surrounded by seven countries, yet it has a heritage distinct from all its Central European neighbors. Alexandra enjoys the food tour in Budapest. Hungarians have roots that are not even technically from Europe. Several different legends and theories surround the origins of the Magyar, now known as Hungarian people. Most historians believe that they come from Asia — past the Ural mountains in present-day Russia. This explains Hungary’s unique culture and traditions, language and food. 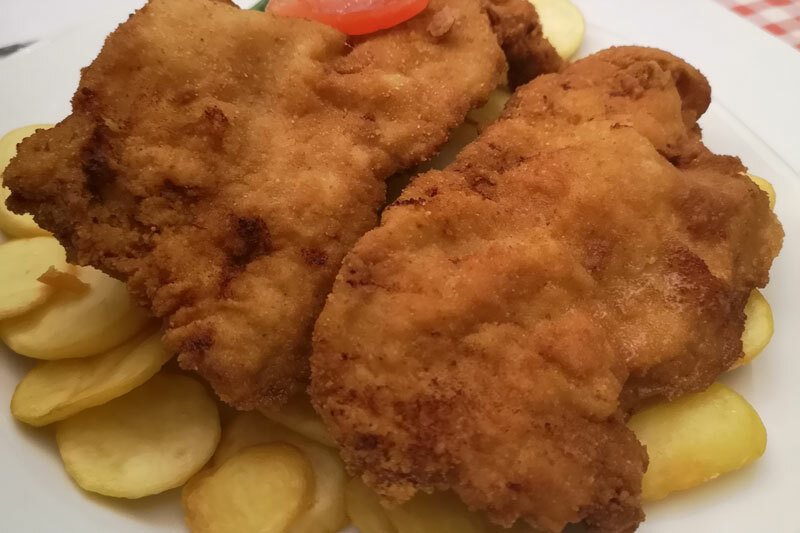 Hungarian cuisine is one of the most rich and flavorful in the whole world. It’s spicy, wholesome and rustic — featuring hearty soups, rich stews and sauces and decadent desserts. Given the climate and geography of Hungary, traditional cuisine makes use of more meat than fish and dishes are always filling and warming. Budapest’s culinary scene is among the best in Europe, so instead of your usual guided tour, we booked a walking food tour of the city. We chose the very well-reviewed Fat Boy Foodie Walk hosted by Máté, a full-time food journalist and true food lover. There is no better place to experience that than the famed market halls. Each of the city’s districts has its own market hall, selling delicious local produce, fresh fruits and vegetables, and Hungarian arts and crafts. In addition to these spectacular indoor markets, the city hosts a number of outdoor weekend markets and design fairs. The best to visit would be the Central Market Hall of Budapest — a three-story cathedral of iron deemed the most amazing market in all of Europe. Here you can take in the sights and smells of Hungarian produce, meats, spices and other ingredients. The most famous of these would be paprika or peppers. Known as “red gold,” paprika is the dominant taste of Hungarian cooking. Countless types of dried and fresh paprika are incorporated into almost every Hungarian dish you will try. On the dining table, paprika appears as a condiment next to the salt and pepper shakers. We started our tour in Rákóczi Market Hall, in District VIII which was built in the same style as the Central Market Hall. The beautiful indoor market had high ceilings with sunlight pouring in from large windows. Máté led us to the first stop on our tour, a humble food stall called JóKrisz Lángos Sütöde tucked away in a little corner of the market. Here we tried lángos, a flatbread of flour, yeast and salt deep-fried in sunflower oil, rubbed with garlic butter then topped with sour cream and shredded Trappist cheese. 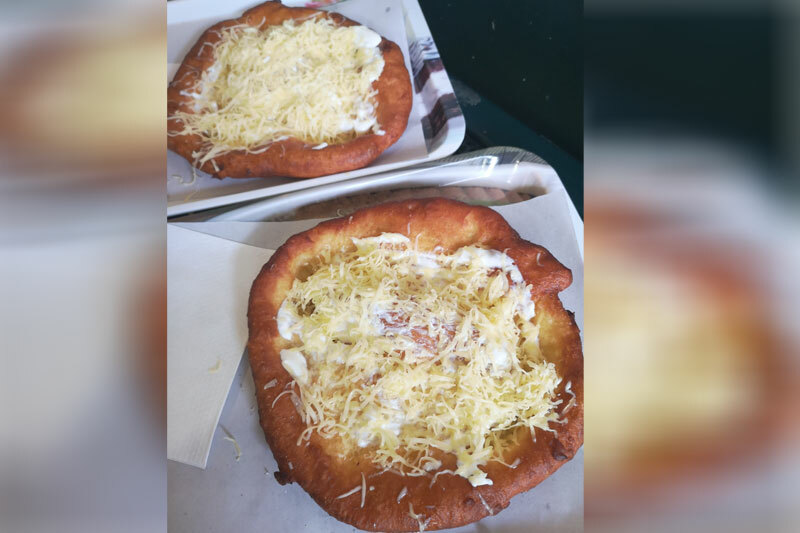 Lángos is the most popular Hungarian street food, now made with a variety of savory toppings from sausage to bacon, and even used to sandwich burger patties. It isn’t traditionally served with sweet toppings, but I couldn’t help but think about how delicious it would be with a dollop of nutella. JóKrisz makes one of the best lángos in all of Budapest. It was perfectly fried — crunchy on the outside, yet soft and chewy on the inside. The fresh garlic butter melts over the surface of the freshly fried dough, adding an extra zing of flavor. Then the sour cream slathered over it cool the heat of the oil. As if it couldn’t get any better, our perfectly prepared creations were generously topped with overflowing shredded mild Trappist cheese. This was absolutely delicious. We were back the next day for more. We strolled down Budapest’s vibrant district VIII back towards the colorful District VII, known as the Jewish Quarters. In recent years, this area has quickly gained popularity for its bars, restaurants and cafés. We passed by a quaint bakery, with a display overflowing with beautiful breads, pies, cakes, cookies and other baked goodies whose names I won’t even dare try to pronounce. The shop was called Budapest Cukrászda, and when we asked Máté what was good there he proudly told us —“everything.” Today, we would try flódni, a Hungarian cake traditionally made for Christmas and other celebrations. Flódni is made up of five layers of dough with four distinct fillings — poppy seed, apple, walnut and plum jam. It takes hours to prepare the dough along with each of the fillings and to assemble and bake the cake but it is well worth it. I’ve never tasted anything like it. It was sweet, tangy, crisp and chewy — unlike any dessert I have ever had. In terms of flavor, it was more like a pie yet with the texture of a very rich and moist cake. The combination of flavors from the fruit and jam fillings was absolutely perfect. Speaking of pies, just a few blocks down the road, we visited Rétesbolt Anno 1926 — a family-run restaurant serving some of the best strudel in the city. Unlike our previous stop, this eatery only served strudel with a rainbow of fillings from tangy fruits and jams to hearty vegetables. We were treated to a live demonstration of strudel making, by one of the members of the family running the shop. That in itself was an artform. We watched in awe as she stretched and tossed dough making impossibly thin sheets, adding in filling and forming the delicious strudel we were about to sample. We ordered two traditional items — plum and poppy seed strudel and cabbage strudel. We also tried salted chocolate strudel. The crust was light and flaky, a perfect contrast to the heavy fillings. The flavors of each were so distinct — the fruit was tart, the chocolate rich yet not too sweet, and the cabbage was salty and savory. We continued to explore the Jewish Quarters, which are not very Jewish anymore today apart from the name. Case in point, we passed countless butcher’s shops which were all brimming with delicacies and customers alike. Máté helped us navigate the crowds and led us into Hús-Hentesáru Szaküzlet where we tried some of the famed Hungarian sausages or kolbasz. 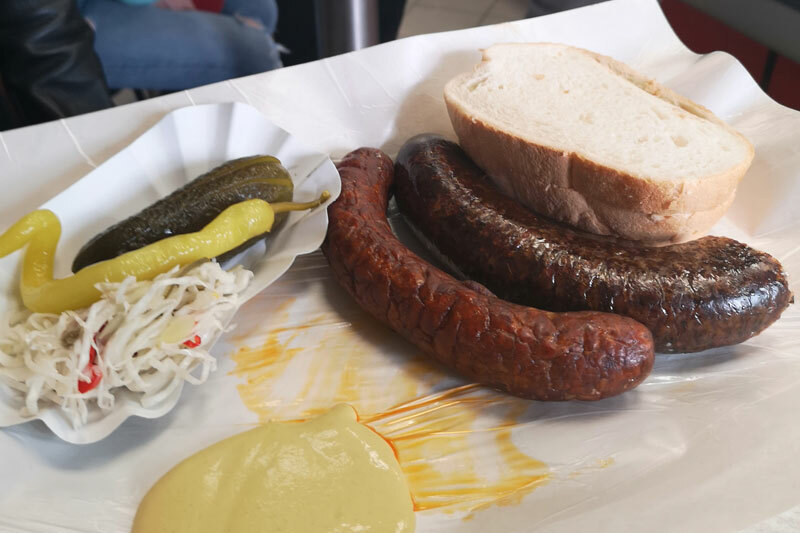 There is a dizzying variety of sausages, made up of fine or coarsely ground pork, beef or lamb seasoned with multiple spices, garlic, white wine or cognac. These can be baked, boiled, smoked or dried in mild to spicy heat. We had our sausages served on an appetizer tray with bread and mustard dipping sauce. One of the standouts was liver sausage stuffed with rice. It was delicious and filling, a complete meal on its own. 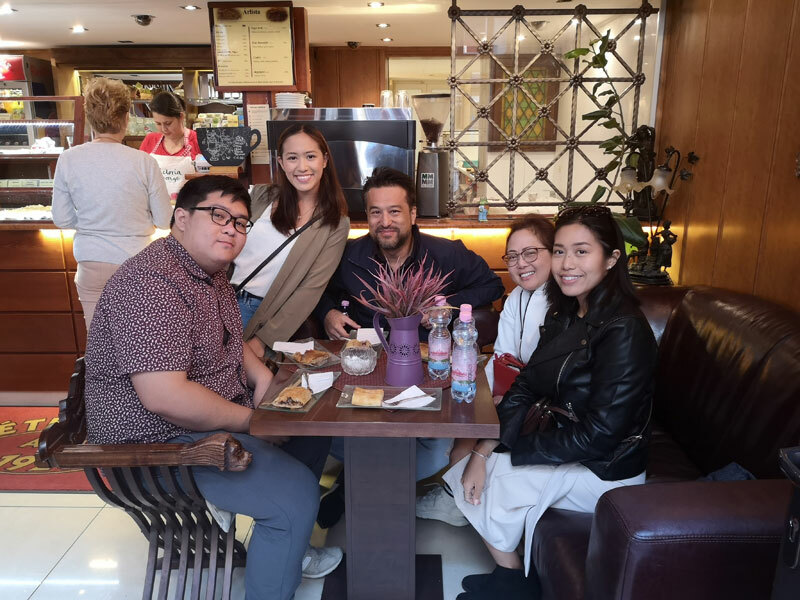 We took a short break from eating for drinks at Garzon Café. Here we toasted with shots of pálinka, a traditional fruit brandy popular all over Central Europe. This stuff is strong and best consumed far from an open flame. It tastes like alcohol with a tiny hint of fruit, but surprisingly still goes down smooth. Budapest boasts a vibrant and exciting nightlife, exemplified by the famous “ruin bars” of the city. Our tour stopped by Szimpla Kert, the original ruin bar. The bar is filled with a mismatch of furniture, antiques, electronics and other knickknacks. 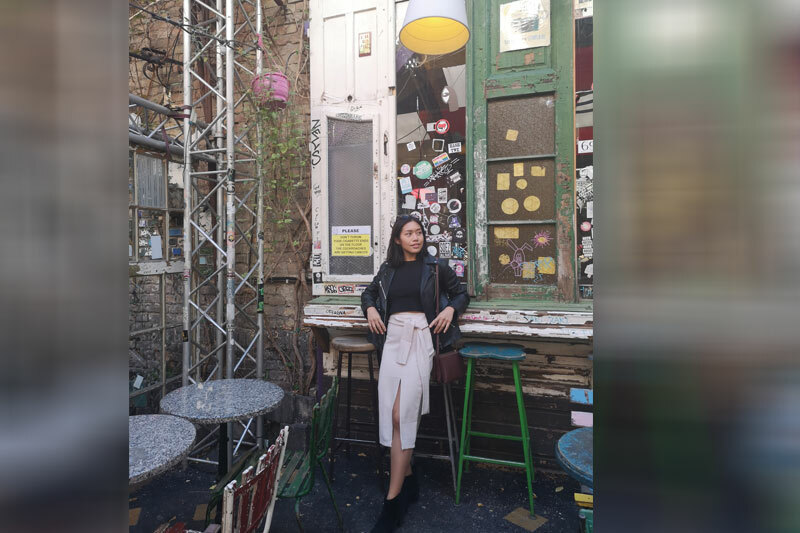 Originally an abandoned house, repurposed by college students as a place to buy cheap drinks, Szimpla Kert is now considered one of the best bars in the world and is a great place to have a drink and dance to music. A walk around the streets of the surrounding blocks will guide you to many fantastic restaurants. As if we weren’t full enough, we sat down to a traditional Hungarian lunch. This always starts with leves or soup. We tried the light húsgombócleves, tiny liver dumplings in bouillon which whet our appetites for the main dish. We tried gulyás, a thick beef soup slowly simmered with onions, potatoes and paprika, served with galuska, soft flour dumplings reminiscent of spätzle. This dish is the most popular amongst locals. 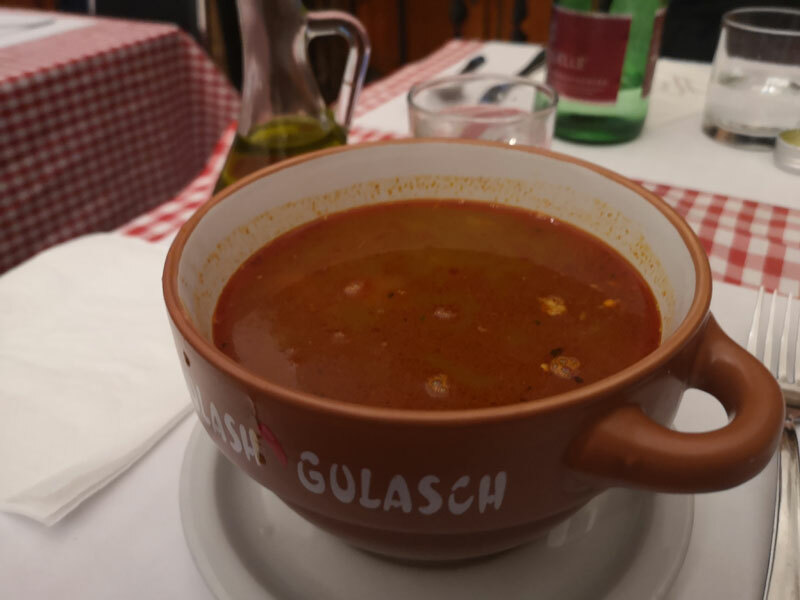 Of course, we could not leave Budapest without trying their national dish — goulash. In Hungary, pörkölt or “stew” is what is known all over the world as goulash, traditionally made with veal. This hearty meat stew seasoned with paprika and other spices was just what we needed to warm up on a chilly night. Hungarian food is by no means light. It’s comfort food in the purest sense of the word — hearty, flavorful and hot. Once you have a taste of Budapest, I am sure that, like me, you will keep coming back for more. Next In Jerusalem, you pray, In Tel Aviv, You Play!